There are fruits, there are vegetables, and there are fruit vegetables. A fruit is the part of the plant that grows from a flower and carries the plant's seeds. All the rest—leaves, stems, and roots—are vegetables. Fruit vegetables are fruits that, instead of being consumed as such, are cooked and eaten as vegetables. In Southeast Asian cooking, these are five of the most popular fruit vegetables. Mention luffa and most people think of the bath sponge. What many don't know is that the luffa bath sponge is the dried fiber of the fruit called luffa. When the fruit matures, the flesh disappears, and only the skeleton of fiber and the luffa's seeds remain. The seeds easily fall off and what is left becomes the bath sponge. 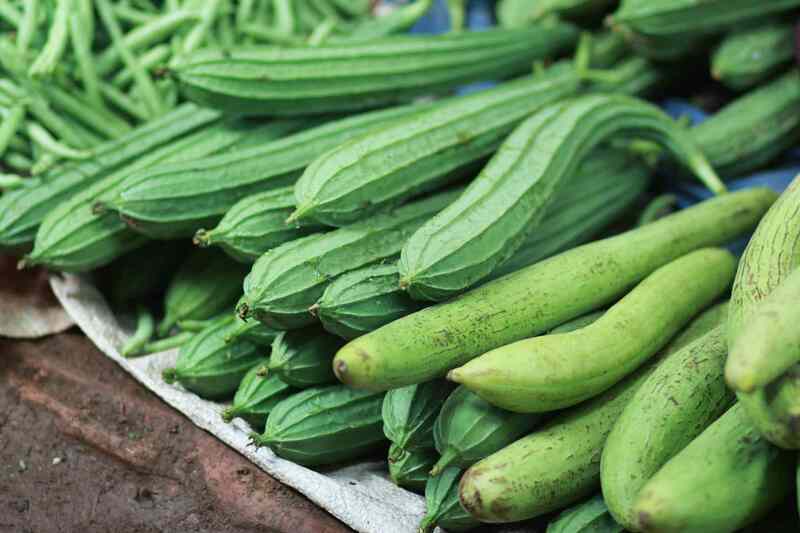 Luffa is a popular fruit vegetable in China, Vietnam, parts of India, the Philippines, Myanmar, and Indonesia. It comes in two varieties, angled and smooth. Luffa is cooked with stir fries, added to soup or chopped as a filling for dumplings. Bitter gourd, or bitter melon as it is also known, is the fruit of the tropical vine called Momordica charantia. It is oblong-shaped, and the skin is bumpy. As its name says, the fruit has a bitter taste. It is a very popular fruit vegetable in Asia because of its texture and because the bitterness can be appealing when combined with other ingredients. Moreover, bitter gourd has a long history as herbal medicine. Bitter gourd is best eaten while the fruit is still young. The bitterness is less pronounced, and the crunchiness of the fruit's flesh makes it an ideal ingredient for stir-fried dishes. While ripe papaya is sweet and can be eaten raw, green papaya lacks sweetness and the flesh, unless cut into very thin strips, is too tough to be eaten raw. In the Filipino soup tinola, green papaya is cut into chunks before it is added to the chicken and broth in the pot. Raw green papaya is a popular salad ingredient in Southeast Asia. The skin of the fruit is cut off and discarded, the seeds and pith at the center are scraped off, then the flesh is shredded finely. The shredded green papaya is tossed with other vegetables like carrots and chilies and served with a simple dressing. Called kundol in the Philippines and bi dao in Vietnam, winter melon is sweet while young. Mature winter melon loses its sweetness and is used as a vegetable for soups and stir-fries. One of the most well-known dishes with winter melon is the Chinese winter melon soup. In Vietnam where it is believed that winter melon helps produce milk, it is cooked with pork ribs as a soup often served to mothers that are breastfeeding. Native to Central America, chayote is labu siam in Indonesia, sayote in the Philippines, su su in Vietnam and sayongte in Thailand. This fruit vegetable tastes rather bland, and the flesh is watery with a slight crunchiness. Chayote is cooked with soups and stir-fries.